FLAMETREE GUESTHOUSE offers 5 beautiful decorated rooms to guarantee our guests privacy and personal service. 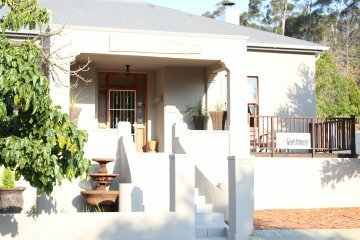 FLAMETREE GUESTHOUSE is situated in the charming town of Swellendam at the foot of the lovely Langeberg Mountains. We strive to be your home away from home. At FLAMETREE GUESTHOUSE we offer our guests five beautiful bedrooms with en-suite bathrooms. Each room is equipped with Flat Screen TV with DSTV, Wi-Fi, heater, fan, electric under blanket, coffee and tea making facilities and a fridge etc. At FLAMETREE GUESTHOUSE there is an outdoor fire place with a sitting area where you can make a fire to relax and enjoy the lovely atmosphere. There is under roofed parking with security lights. FLAMETREE GUESTHOUSE has very reasonable rates which is excellent value for money. Danel & Conrad Engelbrecht are the hosts of FLAMETREE GUESTHOUSE and look forward to spoil our guests with warm hospitality.